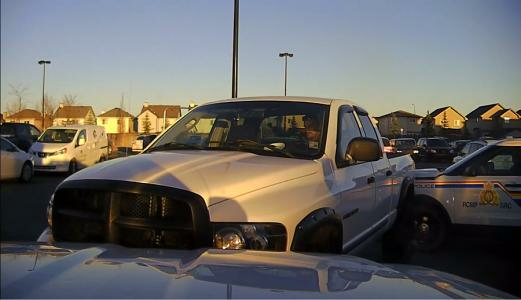 Okotoks, Alberta - Okotoks RCMP are asking for the public's assistance to identify a male suspect after two police cars were rammed. On October 26 at 5:53 pm, Okotoks RCMP were dispatched to a report of an erratic driver in the Walmart parking lot. Officers attended and located the suspect vehicle. The suspect vehicle rammed both RCMP patrol cars, and fled the scene. No injuries were sustained by the RCMP members involved. Further investigation after the events revealed that truck had been reported stolen two days earlier. Okotoks RCMP are now asking for the public's assistance to locate the involved vehicle and identify the driver.